Annan had gone 101 games since they were last involved in a no scoring draw but they dropped from the top of this league statistic in a game where neither team could break the deadlock. Annan came closest when Moxon hit the post at the start of the second half and Blair Henderson’s header struck the cross bar from a Ryan Sinnamon corner in the 54th minute and the closest Berwick came to scoring was in the 77th minute when Atkinson pulled off an important save to push Steven Thomsons free kick round the post. The Annan starting line up showed one change from the side which were defeated by Peterhead with Blair Henderson being given his first starting position at the expense of Scott Roberts. Berwick boss Robbie Horn made one change from the side which lifted the points against Cowdenbeath with Jonathan Fairbairn replacing Kieran Stewart in the starting line up . Annan started the game positively with the majority of Annan’s attacking play being directed down the right through Dan Orsi who had a couple of opportunities to hit the target but both chances went a begging against the well organised Berwick defence. Roddie McCrorie was the busier of the two keepers and in the opening 20 minutes he pulled off confident saves from Omar in the 22nd minute and minutes later Aiden Smith’s miscued shot went wide of the target. Owen Moxon broke up play in the middle of the park in the 36th minute making a surging run forward but the attacking move broke down when Moxon dissapointingly over hit the pass and the promising opportunity was lost. Brannon was next to try his luck but the shot went wide of the post. Berwick never really looked like troubling Atkinson in the Annan goal with the Annan keeper never being seriously tested in the opening 45 minutes but almost on the stroke of half time the visitors had a rare opportunity when they forced their first corner but Annan defended the situation. Annan started the second half looking to pierce the well marshaled Berwick defence and in the 49th minute Blair Henderson finished a penetrating run along the 18 yard line with a pass to Moxon who blasted wide of the target. It was a promising start to the half for Annan and this was followed up by a fine McCorie save from Aiden Smith and from the resulting Sinnamon corner Blair Henderson powering in timed the corner to perfection only for his header to strike the cross bar . It was a let off for the visitors but in the 57th minute Steven Thomson’s vision almost paid dividends when his 40 yard effort almost caught Atkinson off his line with the Annan keeper relieved to see the effort going narrowly over the bar. Berwick were fortunate in the 60th minute when the officials were left with a difficult decision after goalkeeper Robbie McCorie appeared to impede Dan Orsi who was running on to the penetrating through ball with the Berwick keeper stopping Orsi but the officials after consulting with each other dismissed Annan’s appeal for a penalty. On another day it could have been given but not today. Both teams made changes in an effort to win the match and as the game entered the final 20 minutes. In the 74th minute Peter Watson will look back on a missed opportunity when his hurried shot from a favourable position missed the target. Annan then had a let off when Berwick broke from defence and Scott Hooper was lucky only to see yellow when he brought down Murrell but once again the referee dismissed appeals for the Annan player to be sent off. From the resulting Steven Thomson’s free kick from fully 32 yards Jim Atkinson pulled off the save of the match to turn the low shot round the post. McCorie denied Blair Henderson who latched in to a superb Omar through ball who had threaded the ball through to the big striker. Annan were then presented with a late opportunity when Moxon was fouled by Notman 25 yards out but Sinnamon’s free kick was directed straight into the arms of keeper McCorie. 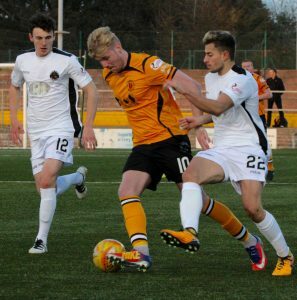 Annan Athletic Jim Atkinson, Scot Hooper, Jack Brannan , Owen Moxon, Peter Watson, Steven Swinglehurst, Daniel Orsi (Scott Roberts 71 min) ,Ryan Sinnamon, Aiden Smith (John Cunningham 68 min), Blair Henderson, Rabin Omar. Subs not used Alex Mitchell, Ayrton Sonkur, Brandon Luke, James Creaney, Peter Murphy. Berwick Rangers –Robbie McCorie, Oliver Fleming , Stephen Notman , Johnathon Fairburn, Stephen Thomson (Aaron Murrell 69 min), Darren Lavery (Kieran Stewart 82 min) , Michael McKenna , Gary Phillips, Andrew Irving ( Christopher McDonald 82 min), Marcus Godinho, Patrick Scullion . Subs not used Kevin Waugh, Jack Cook, Robert Wilson, Sean Brennan GK. Referee – Mike Roncon ​​Assistants – Willie Conquer and Eddie Ferguson. All the title contenders picked up full points Stirling defeated Edinburgh City 2-1, Montrose are hard on their heels after they lifted the points with a 3-1 victory against bottom club Cowdenbeath . Peterhead followed up their victory over Annan with a 2-0 victory in the derby match at Elgin. Stenhousemuir lost ground at the top following their 1-1 draw with Clyde.